Fake labour brokers may not be able to take advantage of country labourers looking for jobs in Ho Chi Minh City as volunteers are working hard at the city's bus stations to provide information on prospective employers, appropriate vocational courses, and ways to live economically to minimise their living costs. Holding a signboard that read, "Free introduction to job search", in one hand and a handful of leaflets on a job introduction programme in the other, student Nguyen Hoai Phuong approached a countryman as soon as he stepped off the bus. "If you are looking for jobs, you can go to our job introduction office, 'Giving strength to labourers', over there. Our staff will give you (access to) consultancy jobs and an introduction to prospective employers, free of charge. And here is a leaflet on the programme. You can look at it and introduce it to your friends," Phuong told the man. In this way, Phuong and other volunteers at the city's major bus stations--Mien Dong, Mien Tay, An Suong, and Nga Tu Ga–have helped thousands of rural people find jobs in the city. They can choose suitable jobs that are taken from job listings hung on the notice boards of job introduction offices at bus stations. They can also directly contact prospective employers through the available telephone numbers. Alternatively, job seekers can fill out job registration forms and ask staff at job introduction offices to help them contact employers. In addition, volunteers also provide job seekers information relating to transport, accommodation and other aspects of city life that will help the latter minimise their living costs. The head of the volunteer group, Dang Vien, said all volunteers had been trained in communication skills, job seeking processes, application form filling processes, and behaviour and adaptation skills before joining the programme. According to volunteer Dang Thi Lan Anh, many people had to return home after they were unable to find jobs in the city. Yet, after being informed about this programme, they have come back to the city and found job opportunities here. Twenty-five-year old Le Minh Hoang is among the labourers who found a job in the city thanks to the "Giving strength to labourers" programme. Hoang was jobless when he returned home from military service early last year. Like most people who believe there are more job opportunities in big cities, Hoang decided to move to Ho Chi Minh City to look for work. Although he did not know where to find a job and felt like a stranger in the city, which is renowned for its energy, noise and bustle, Hoang was warmly welcomed by the programme volunteers as soon as he got off his bus at the Mien Dong bus station. "I did not know what was waiting for me, but I felt secure because I was warmly received and introduced to jobs by volunteers," Hoang recalled. "It was an act of mercy for them to support me; otherwise, I would not have known where to start," he added. As Hoang has not received any specialty training, he was introduced to work at a package printing company in Tan Binh District. Having worked at the company for more than a year, he has been promoted as a mechanic and is paid VND3.5 million (US$160) per month. Earlier, he was a manual worker and received a monthly income of VND2.2 million. It is not only labourers who have received support from the programme but also people with degrees in different specialties. Dinh Thi Thuy Dien graduated from an intermediate level accounting course and landed a job as an accountant at a commercial company after programme volunteers introduced her to the job. The director of the Centre for Vocational Guidance, Training and Job Introduction for Youth, Nguyen Tri Quang, said the initiative to set up employment offices at the city's bus stations was implemented to ease the difficulties faced by countrymen from different localities when they moved to the city to look for jobs. Because they had little knowledge of the city and its employment situation, fake labour brokers were able to take advantage of the job seekers' disadvantaged situation, forcing them to pay high fees to get jobs. Consequently, many people received very difficult jobs with meagre salaries after paying a lot of money to the labour brokers. The centre cooperated with the Sai Gon Transportation Mechanical Corporation (SAMCO); the Tuoi Tre (Youth) newspaper; the YES centre; and the Youth Union organisations of Binh Tan, Binh Thanh, Hoc Mon, and District 12 to establish job introduction offices at the bus stations. Starting in 2011, the employment offices at the city's main bus stations have received 44,000 newly arrived job seekers. Of which, 13,825 job seekers have found stable jobs with average incomes ranging from VND3 million to 15 million, Quang said. Recruitment demands increase each year, with this year seeing an increase between 20 and 25 per cent compared with demand in 2011. 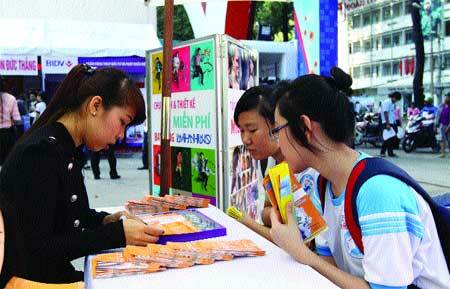 Recruitment demand for newly graduated students increased 40 per cent in the same period. This does not include the thousands of jobs available for skilled labour and white-collar workers. To create jobs for labourers, the employment offices have collaborated with more than 250 local companies, which have sent out over 20,000 job opportunities to labourers. The manager of Gia Bao package printing company, Lu My Tinh, noted that the programme had introduced two workers to the company early last year. They have been working hard and are eager to learn. Commenting on the programme, the Starmart supermarket personnel manager in Go Vap District, Tran Thi Kieu Lien, asserted that this is a good and meaningful programme. "The programme connects labourers with local companies. It has helped workersfind suitable jobs, and employers can find suitable people without spending lots of time and effort on the search," she explained. The supermarket has employed three workers through the programme. They are good and eager for progress.